A mural stretching over three miles landed the Pueblo Levee Mural Project a place in the Guinness Book of World Records as the world’s farthest-stretching painted artwork. 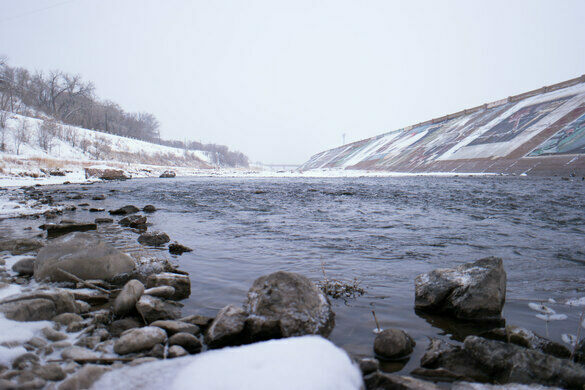 The Pueblo Levee Mural Project began in the 1970s with a group of college students tagging the concrete levee that flanks the Arkansas River in Pueblo, Colorado. According to Cynthia Ramu, a local artist who voluntarily served as the Project’s coordinator for over 20 years, the Levee Mural began with a sole depiction of a fish, which popped up overnight. The fish was soon inside a bathtub, and eventually joined by a team of rubber ducks. What began as a youthful pastime became a renowned public art project famous for its size and ambition—as many as 1,000 artists may have contributed to the concrete canvas over the course of four decades. But the levee itself, which was built following a flood that killed hundreds of people in Pueblo in the early 1920s, was showing signs of serious degradation when the decision was made to reinforce the concrete. 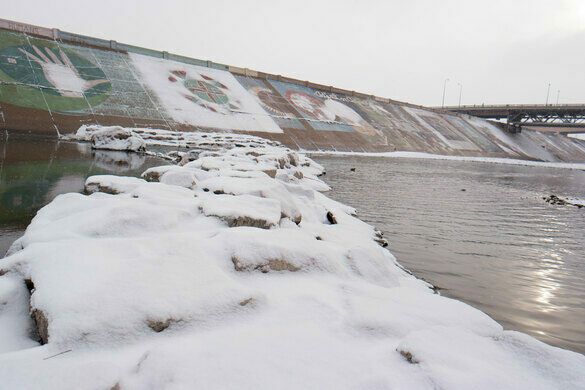 In 2014, the Pueblo Conservancy District green-lit a multi-million-dollar series of restoration projects that would secure the levee for the public’s safety, but much to local dismay, at the cost of the Levee Mural. Prior to the first phase of restoration, a $3.6 million job aimed at securing downtown Pueblo, the Pueblo Conservancy District hired local commercial and aerial photographer John Wark to capture the artwork before its ultimate destruction. Wark was instructed to shoot exceptionally hi-res photographs of the Levee Mural Project to preserve the record-breaking masterpiece in large-scale prints at eight by ten feet. The levee’s demolition began in 2014 and took place over the course of several winters.